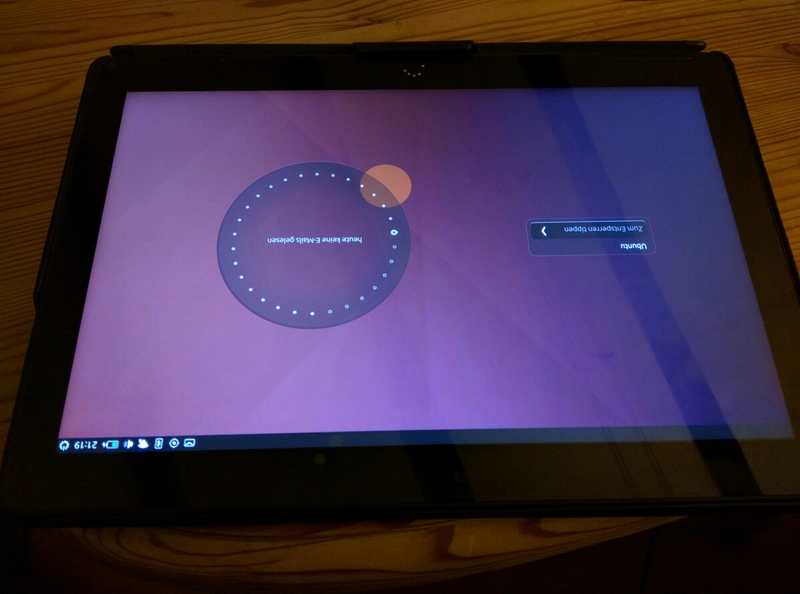 I just received my pre-ordered BQ Aquaris M10 Ubuntu edition and had a few days to test it. Time for me to share my experience. The tablet itself is quite nice. Good form factor, great display and easy to hold. The device came with a case and a display protector, even though I don’t seem to have a talent for putting foils on displays. The Aquaris M10 comes with only 16 GB of internal memory but offers a MicroSD slot for another 64 GB, which is not overwhelming but enough for my everyday use. Wifi and Bluetooth are on board but LTE is missing and plugging a dongle into the MicroUSB port doesn’t seem to work, at least not without doing some handicrafts. Furthermore the device is equipped with an audio jack and a MicroHDMI port. The latter one works quite nicely. Just plug in a display and the tablet switches to desktop mode. The tablet display then turns into a touch pad and allows you to control the mouse arrow. The keyboard appears whenever text has to be entered. Does not work perfectly yet but good enough in case you left your Bluetooth keyboard and mouse at home. There are some standard apps preinstalled and the store offers a lot more to download. Many of those programmes seem to be ‘Web Apps’, which means that a browser is wrapped around a frame and opens a fixed URI. Works, but in my eyes this does not always guarantee quality and speed. The Ubuntu Touch software keyboard is better than I expected. It responds quickly and typing is relatively easy as long as you use a two-finger system. The auto-correction could be smarter but I know Android keyboards that are way worse. But it’s still a long way to go. I love Ubuntu and have been a user for more than ten years on my PCs. It is a safe, fast, powerful and easy-to-use operating system and my expectation was to get exactly that on a tablet. Sadly Ubuntu Touch does not share much but the name with the regular OS. It just works differently. It has a different look. And the programmes I am used to just don’t run. In addition it has to be said that the system is pretty much locked and you just can’t tweak those tiny things you can in Ubuntu. Furthermore Ubuntu Touch is still quite buggy. I have no idea why Canonical has not been able to fix minor problems with the display rotation. It’s nerve-racking that the lock screen is headlong when you have been typing on a desk. Why doesn’t it rotate as well?! And why doesn’t the Google login work? I am coming from Android and trying to migrate to Ubuntu Touch. Whenever I start a Web App I have to log into my Google account every single time. That makes them unusable. Let’s have a look at the browser: I am a Firefox guy. Firefox is on my laptop. Firefox is on my phone. Firefox is even preinstalled on the Aquaris. But it doesn’t work without external mouse and keyboard (same with LibreOffice by the way). Ubuntu Touch comes with it’s own browser which seems to be based on Safari. It is okay but surely not the best thing out there. Chrome doesn’t run as well, which makes it impossible to use Netflix or Amazon Prime Video on the device. Of course there is no app available even though it would be ridiculously easy IF Chrome would work. I did this myself on my laptop even though I am not a programmer. The philosophy behind Ubuntu Touch differs from the one of Android or iOS. It’s convertibility – from phone to tablet to desktop, depending on your need in that very moment – is a huge plus and this is where I see Canonicals chance to take a niche, grow it constantly and become the segment’s third largest player. I am not as happy as I expected. Nevertheless I will stick with my new tablet and keep improving this – potentially – great OS with comments and bug reports.